We at Best for Film are very big fans of Charlie. Can you tell us a bit more about it? I guess the process was quite unusual for me in that, apart from doing commercials, this was the first time that an idea was given to me first [by Virgin Media Shorts]. We knew that we would set the film in London and that it would feature multiple Charlie Chaplins; so I took that idea and wrote a narrative which provided a logical reason why there would be so many Charlie Chaplins. I had the idea of them as a flash mob, a coming together of all of these Chaplins, and I also wanted to reference the silent film era but without satirising or making a joke out of it. No fast running to piano music or stuff like that. Instead, Charlie has quite a romantic feel to it, and it hints at an interesting back story. Was any of it based on real events? Most of it was invented for the film. I wanted it to have a touching and human feel to it rather than it being slapstick comedy, so that was the story I came up with. 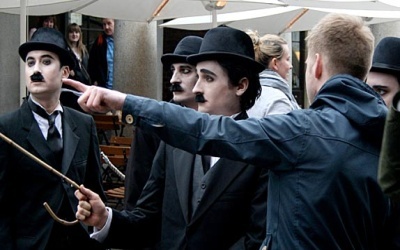 Charlie Chaplin as a figure had meant so much to the lead character, and it’s hinted at that this character’s dad has passed away with the film showing the character remembering him. All of it was invented, I wanted to make Charlie Chaplin the driving force of the character. The idea is much more of a story than a commercial. Well it worked! How did you find the many Charlies who appear in the film? My producer James and I started by casting the lead Charlie, who is an actor called Michael Peluso. But it wasn’t until the day of filming that we were introduced to the rest of them. In fact it was a really fast turnaround. I think I received the idea and had written the script a week before we shot, then we shot it in one day. Everything happened at a huge rate of knots, including the post production which we finished a day later and then we immediately uploaded it to YouTube. It was pretty mental! That is amazingly quick. You would never have known the speed from the quality of the finished product. It must have been quite an honour for you to be chosen to open the Virgin Media Shorts competition this year. How did you get involved? It was an honour, it was really nice for them to ask me to do that. In fact, the direction my career has taken has basically come from winning the Virgin Media Shorts competition in 2009 with Mixtape. It means a lot to me and it was nice to come back again and do something else for them. I think that what Virgin Media Shorts are doing is great and I really support it and they wanted to do this film [Charlie] to open the competition, and here we are. Absolutely. Between Mixtape and Charlie you seem to like to make work that is set in the recent past. Because the main character in Mixtape has a cassette tape, it must be set perhaps in the 80’s or the 90’s. Is it a conscious decision to set things ambiguously? In Mixtape there was a conscious decision to set it at a particular time but without obviously showing it. It’s actually set in 1995. It’s really difficult to tell when it was set and I didn’t want the period detail to be in your face, like having a 1995 car or a piece of music from that year. The way you can tell is that it is printed on the top of the NME in the opening credits in tiny letters, but it is there! Mixtape is an autobiographical work of mine. I remembered a time in my life I wanted to recreate, but again not an obvious way but in a textural way, so I could show what it felt like to be around that period. Mixtape shows the defunct newspaper Melody Maker and little bits like that around the lead character’s bedroom. I also had the idea of tying that in with the music from the 70’s which was music that my parents gave to me when I was a kid. That music had a huge impact on me growing up, and that was the reason why I wanted to set it in the recent past, which had something different to today. And the idea of giving someone something tangible like a tape is quite old school! Today you’d only make a playlist, so maybe it’s a more romantic way of telling someone that you like them than sending them an email or a tweet! Definitely more personal. I really liked the part with the wall reverberating from the thumping music, where the lead character can hear the girl next door singing and dancing. It’s funny as a lot of people think that there actually was a girl who lived next door to me! That wasn’t the case unfortunately, I took some dramatic licence. So did you have any success with your real life mixtapes? There wasn’t one specific girl, like in that scenario. I would make these tapes as presents for family and stuff where I would do an intro with a hand-me-down microphone and my radio DJ voice and give them away as presents to my family, and at a later point to girls that were interested. But the whole next door thing was invented. It was also great from a visual point of view, where the camera panned across to her jumping on the bed and panned back to his smiling face. There was definitely that aspect to it from the beginning I wanted the viewer to know that [the lead character] was going to go on an epic journey, but the epic journey was only really next door. In his head it was a big ordeal and a difficult thing to do but really he was just going next door. Mixtape has proved immensely popular and a worthy winner of the Virgin Media Shorts best film award, with 58,000 views on YouTube alone. Some of the commenters wanted it to be longer or feature length. Are there any plans to lengthen Mixtape or Charlie? Charlie was more of a one off piece that had a certain visual tone and a subject that I didn’t know much about, but to answer the question, after Mixtape, I made Disco. It’s not exactly a sequel but it’s longer at 15 minutes, also stars Bill Milner (star of Mixtape) and had similar themes. Disco is set in 1997 but I am actually currently writing my first feature which is has the same vibe to it and is set in 1996. Ooh tell us some more. Gone to casting yet? I’m not allowed to give too much away but it’s called The Wanderers, and it’s a musical. We haven’t cast it yet but we have some ideas and have spoken to a few people about cameos and that kind of stuff. I am still writing the script at the moment and we’ve received some development funding to write it. I delivered the first draft 3 weeks ago and I am just working on the amendments. We’re still at quite an early stage and hope to make it next summer. Keep us updated on the progress of The Wanderers, a musical sounds awesome. 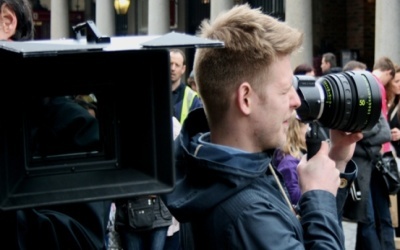 Going back to this year’s Virgin Media Shorts competition, have you seen any of this year’s entrants? Yes I saw a film called Bistro which I thought was good, which has Peter Capaldi in it and I also saw Rocket which was fun. Rocket is about a dog that built a rocket. The director who made that showed some serious animal wrangling abilities! I have seen a couple but not a great deal. I think the closing date is 7th July, so there is still time for others to enter. Thank you so much Luke, it’s been grand. Check out Luke’s film Charlie here. There is still time to enter this year’s Virgin Media Shorts competition – so consider this a call to action for all aspiring film-makers. To enter make your way over to www.virginmediashorts.co.uk.